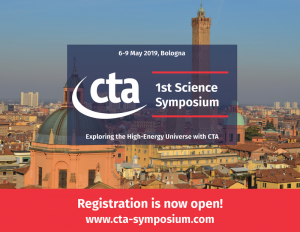 The Cherenkov Telescope Array (CTA) will host its first CTA Science Symposium 6-9 May 2019 in Bologna, Italy. 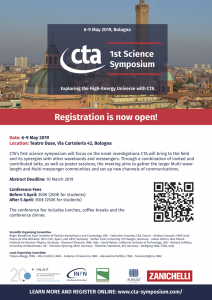 The symposium will focus on the novel investigations CTA will bring to the field and its synergies with other wavebands and messengers. It will also cover instrument characteristics, analysis tools and opportunities for guest investigators and how coordinated observations with CTA will have a significant impact on the exciting new era of multi-wavelength and multi-messenger astrophysics. Among the field of highly-accomplished speakers that will be in attendance are CTA Spokesperson and Director of the Max Planck Institute for Nuclear Physics in Heidelberg, Werner Hofmann, as well as two Nobel Laureates in Physics, Takaaki Kajita and Rainer Weiss. CTA will be the foremost global observatory for very high-energy gamma-ray astronomy over the next decade and beyond. As the construction phase of CTA’s two arrays (one in La Palma and one in Chile) nears, the excitement for CTA’s scientific potential continues to grow. The potential is extremely broad: from understanding the role of relativistic cosmic particles to the search for dark matter. CTA will explore the extreme Universe, probing environments from the immediate neighbourhood of black holes to cosmic voids on the largest scales. With its ability to cover an enormous range in photon energy from 20 GeV to 300 TeV, CTA will improve on all aspects of performance with respect to current instruments. And its wider field of view and improved sensitivity will enable CTA to survey the sky hundreds of times faster than previous TeV telescopes. The event will be held in the historic centre of Bologna, Italy at the Teatro Duse. Registration and the call for contributed talks are now open. If you register before 5 April, the fee is 300 euro (200 for students). After 5 April, the fee will be raised to 350 and 250 euro respectively. This covers all lunches, coffee breaks and dinner at the beautiful Palazzo Re Enzo. Talks may cover the following areas: cosmic particle acceleration, compact objects and relativistic shocks, role of cosmic particles in galaxy evolution and star-forming systems, gamma rays as cosmic probes, fundamental physics, multi-wavelength and multi-messenger observations and, additionally, any topic connected to the scientific possibilities of CTA. Submit your abstract to http://www.cta-symposium.com/abstract-submission/ (deadline: 10 March 2019). Register and learn more on the event site (https://www.cta-symposium.com/) and the Facebook event (https://www.facebook.com/events/1802360373151088/).